The centipede: a stone cold killer. Nature it seems is fond of extremes. In the world of reptiles the hands down lethal hunter is the snake with no legs at all. 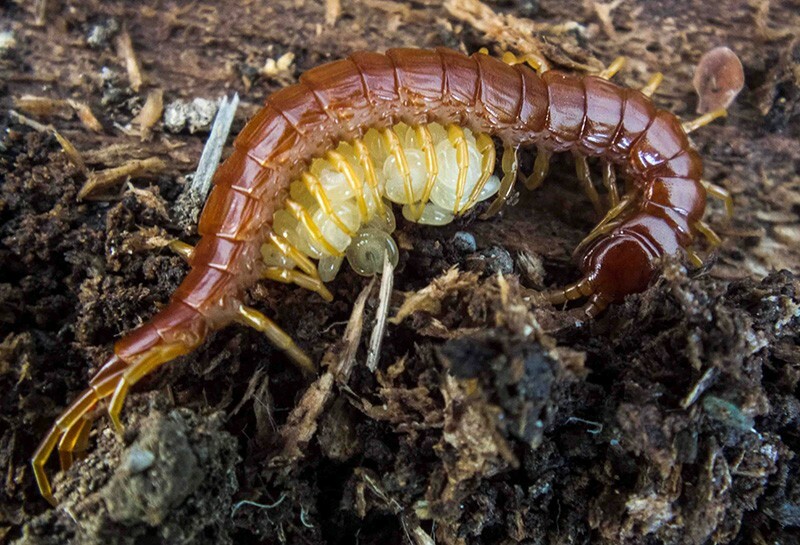 In the arthropod world, one of the most capable killers is the centipede (Latin for "100 feet") with 30 to over 100 legs (depending on species). A centipede with her babies. How does it coordinate all those limbs? Its antennae send messages to the brain, which sends the first set of instructions to the segment which controls its first pair of legs. They act accordingly and modify the signal as necessary, passing it along to the next segment, and so on and so on. If the poor thing had to contemplate the complexity of it all, it would probably never take another step. 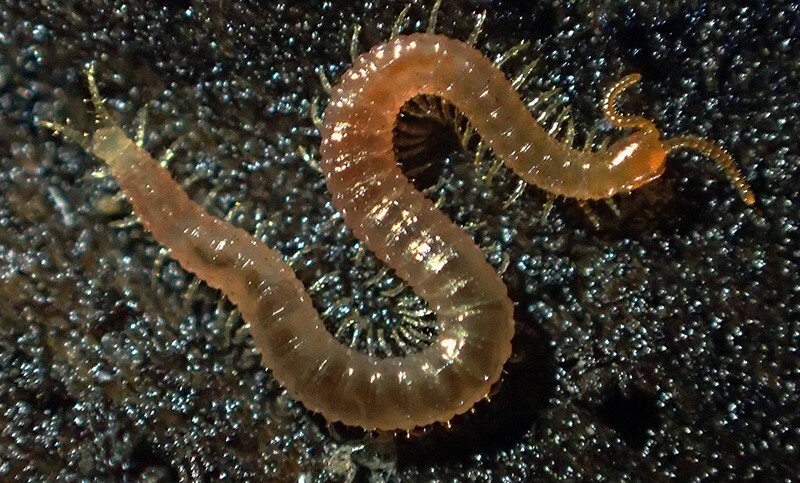 A centipede's charming forcipules — legs that act as fangs. 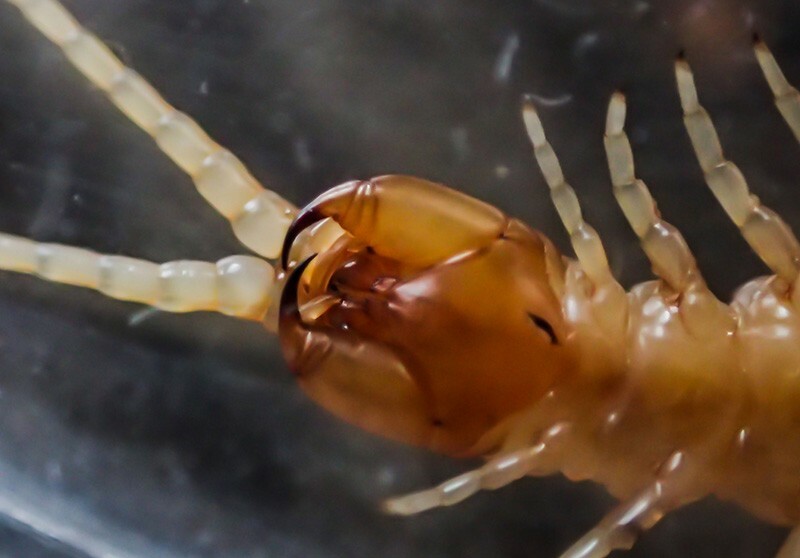 Class Chilopoda, (centipedes) are all carnivorous, having highly modified front legs which act as venomous fangs (or forcipules), and dozens of pairs of legs. Interestingly enough, the legs are shortest in front and get longer at the rear in a regular progression so they do not interfere with each other when the beast launches into an attack or away from danger. The largest in the world is currently the Amazonian giant centipede, which can attain lengths of a little less than a foot long and is capable of catching and eating bats. Here Humboldt County I have seen three different species all maxing out at a little over three inches in length.